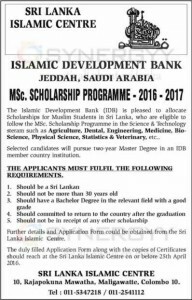 Islamic Development Bank of Saudi Arabia announces a special Scholarships for Muslim Students in Sri Lanka under Sri Lanka Islamic Centre for MSc. Scholarship Programme – 2016 – 2017. The Islamic Development Bank (IDB) is pleased to allocate Scholarships for Muslim Students in Sri Lanka, who are eligible to follow the MSc. Scholarship Programme in the Science & Technology stream such as Agriculture, Dental, Engineering, Medicine, Bio-Science, Pliysic.il Science, Statistics & Veterinary, etc.. Selected candidates will pursue two year Master Degree in an IDB member country institution. The applicants must fulfill the following requirements. Further details and Application Form could be obtained from the Sri Lanka Islamic Centre. The duly filled Application Form along with the copies of Certificates should reach at the Sri Lanka Islamic Centre on or before 25th April 2016. I am nazeer ameer from dharul hasanath childrens orphanage,mawanella.I have passed my G.C.E O/l examinations with 9A .i have done my advanced levels also. I have got an opportunity to study medicine in belarus .grodno state medical university. But as i am from an orphanage i am struggling for the payments.so if u can help me it would be a great help.